When I was walking across the Brooklyn Bridge last weekend, I was surprised to see locks attached to it. My first thought was, What are we, Paris? It seems the locks attached to Pont des Arts over the Seine were the first I heard of this craze of lovers writing (or engraving!) their names and the date on a lock, attaching it to the bridge, and throwing away the key in the water below. Forgive the eye-roll, but really? I imagine its teens or young people doing this, don’t most people just get married if they want to declare their love to the world? The Brooklyn Bridge is easily my favorite of New York City’s many bridges—though I have a soft spot in my heart for the Verrazano-Narrows Bridge, the Manhattan Bridge (so dumpy and quiet, I just love it), and the 59th Street Bridge (and yes I know it was renamed)—and I hate hearing how the weight of so many locks are damaging the bridge. 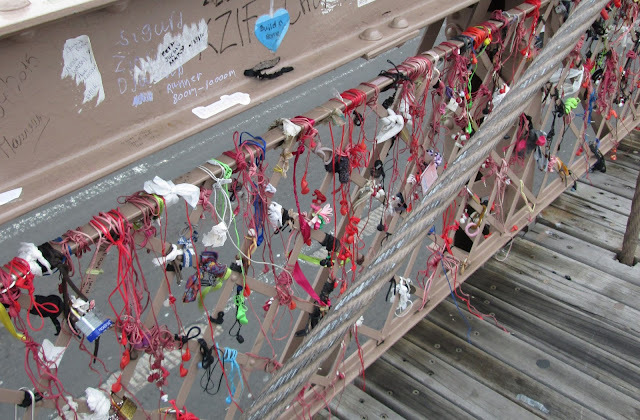 So let this Brooklynite make a plea—it’s great that you are in love, but leave your locks at home, or back at the hotel, and do not attach them to a beautiful and historic bridge that is a working bridge and vital to the city’s inhabitants making their way in and out of Brooklyn by foot, bike, and car! Apparently I am not the only one annoyed by the locks. 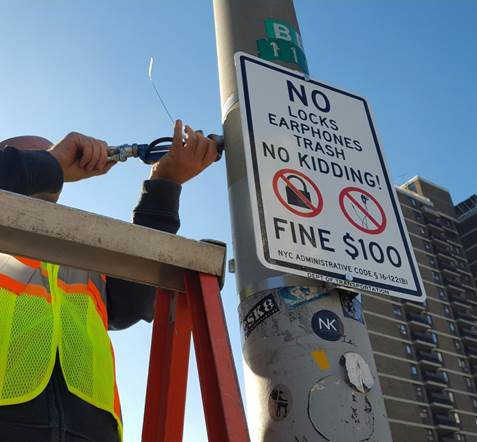 I heard on the news the other night that the New York City Department of Transportation has been cutting off the locks on the Brooklyn Bridge since 2013 and it has cost them $116,000 a year to do so. Since the locks continue to be a problem there will now be a fine of $100 if you are caught placing one on the bridge. Good! I noticed more earbuds tied to the bridge than locks but that seems ridiculous as well and you will be fined if you attach those to the bridge too. More earbuds than locks, but they all have to go. Is this a problem where you are, with lovers attaching locks or earbuds to local bridges? Or does this only happen in big cities? I have crossed the Brooklyn Bridge many many times, As well as the Manhattan, Williamsburg & Verranzano. The Brooklyn Bridge is by far my favorite. I also hate those locks. I didn't like them in Paris either. I walked across this past July and it was crowded. Jill was just in Salzburg this summer and they have a famous bridge with locks covering it too. So far they are okay with it. I think the Brooklyn Bridge needs no locks. It's one of the most lovely bridges I have ever seen. Love it.